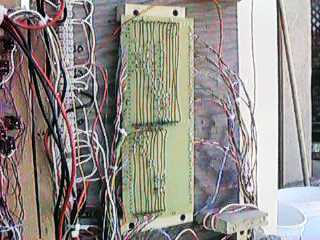 The other part of the interlocking turnout control system is a diode matrix. This simple circuit determines which turnouts should be thrown in which direction to set up a route through the trackwork. The 5474 converter circuits energize a pair of rows, one positive and one negative. Diodes are connected between the rows and columns. Each turnout motor is connected to one column. The presence of a diode at a junction will cause turnout to be thrown when its row is energized.